Fortrose & Rosemarkie Image Library - Steam engine at Fortrose station. Steam engine at Fortrose station. As loons we used to "help" pushing the engine round on the turntable and tried to make pennies by putting ha'pennies on the rails and watching them being squashed by the train. It wasn't very successful as they came out far too big. They were "Ben" class locomotives? 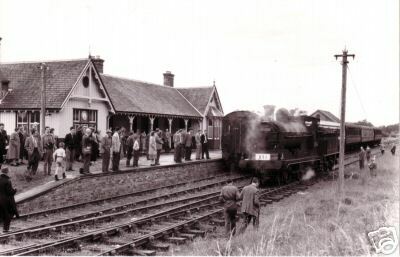 The last Passenger Train ran from Fortrose Station ran on the 1st Oct.1951. There are I think no less than 5 carriages, and a large crowd of people. I think this looks like the last train in 1951. The Engine has been uncoupled, and is heading for the turntable to be turned round then re-coupled to the other end of the train for the return trip. The 2 coaches almost hidden by the loco are the 2 preserved Caledonian Railway coaches restored in conjunction with CR 4-2-2 No.123.